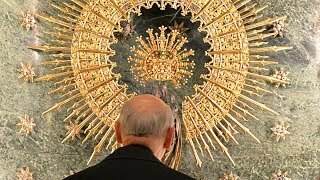 The Founder of Opus Dei saw in St. Joseph the strong and affectionate father that Christ wanted on earth. He asked St. Joseph to teach him how to stay close to Mary and to Jesus: “How he would have embraced the Child, and kissed him!”. Download pdf. The Founder of Opus Dei saw in St. Joseph the strong and affectionate father that Christ wanted on earth. He asked St. Joseph to teach him how to stay close to Mary and to Jesus: “How he would have embraced the Child, and kissed him!”. Saint Joseph, father of Christ, is also your father and your lord. Ask him to help you. Saint Joseph, our father and lord, is a teacher of the interior life. Place yourself under his patronage and you'll feel the effectiveness of his power. Speaking of Saint Joseph in the book of her life, Saint Teresa says: 'Whoever fails to find a Master to teach him how to pray, should choose this glorious Saint, and he will not go astray.' — This advice comes from an experienced soul. Follow it. Ask your Mother Mary, ask Saint Joseph and your Guardian Angel to speak to the Lord and tell him the things you can’t manage to put into words because you are so dull. Saint Joseph: One cannot love Jesus and Mary without loving the Holy Patriarch. There are many good reasons to honour Saint Joseph, and to learn from his life. He was a man of strong faith. He earned a living for his family — Jesus and Mary — with his own hard work... He guarded the purity of the Blessed Virgin, who was his Spouse. And he respected — he loved! — God’s freedom, when God made his choice: not only his choice of Our Lady the Virgin as his Mother, but also his choice of Saint Joseph as the Husband of Holy Mary. Saint Joseph, our Father and Lord: most chaste, most pure. You were found worthy to carry the Child Jesus in your arms, to wash him, to hug him. Teach us to get to know God, and to be pure, worthy of being other Christs. And help us to do and to teach, as Christ did. Help us to open up the divine paths of the earth, which are both hidden and bright; and help us to show them to mankind, telling our fellow men that their lives on earth can have an extraordinary and constant supernatural effectiveness. Love Saint Joseph a lot. Love him with all your soul, because he, together with Jesus, is the person who has most loved our Blessed Lady and been closest to God. He is the person who has most loved God, after our Mother. —He deserves your affection, and it will do you good to get to know him, because he is the Master of the interior life, and has great power before the Lord and before the Mother of God. There are countless ways of praying, as I have already told you. We children of God don't need a method, an artificial system, to talk with our Father. Love is inventive, full of initiative. If we truly love, we will discover our own intimate paths to lead us to a continuous conversation with Our Lord. May God grant that what we have contemplated today will not pass over our souls like a summer downpour — a few drops of rain, then once again the baking sun and the fields are as dry as before. The water of God's grace needs to settle, to seep through to the roots and bear fruit in virtues. If we let it do this, our years on earth — made up of days of work and prayer — will be spent in the presence of Our Father. If we falter, let us turn to Holy Mary who loves us and teaches us how to pray; and to St Joseph, our Father and Lord, whom we venerate so much. In this world he was the one who was closest to the Mother of God and, after Mary, to her Divine Son. Together they will bring our weakness to Jesus, so that he may turn it into strength. The whole Church recognizes St Joseph as a patron and guardian. For centuries many different features of his life have caught the attention of believers. He was a man ever faithful to the mission God gave him. That is why, for many years now, I have liked to address him affectionately as "our father and lord." St Joseph really is a father and lord. He protects those who revere him and accompanies them on their journey through this life — just as he protected and accompanied Jesus when he was growing up. As you get to know him, you discover that the holy patriarch is also a master of the interior life — for he teaches us to know Jesus and share our life with him, and to realize that we are part of God's family. St Joseph can teach us these lessons, because he is an ordinary man, a family man, a worker who earned his living by manual labour — all of which has great significance and is a source of happiness for us. As we celebrate his feast day, I should like to remind you of him, and of what the Gospel says about him. This will help us find out what God is telling us through the simple life of Mary's husband. Scripture tells us St Joseph was a craftsman. Some Fathers of the Church add that he was a carpenter. When talking of the life of Jesus, St Justin says that he made ploughs and yokes. Perhaps that's why St Isidore of Seville concludes that St Joseph was a blacksmith. In any event, he was a workman who supplied the needs of his fellow citizens with a manual skill acquired through years of toil and sweat. The Gospels give us a picture of Joseph as a remarkably sound man who was in no way frightened or shy of life. On the contrary, he faced up to problems, dealt with difficult situations and showed responsibility and initiative in whatever he was asked to do. I don't agree with the traditional picture of St Joseph as an old man, even though it may have been prompted by a desire to emphasise the perpetual virginity of Mary. I see him as a strong young man, perhaps a few years older than our Lady, but in the prime of his life and work. You don't have to wait to be old or lifeless to practice the virtue of chastity. Purity comes from love; and the strength and gaiety of youth are no obstacle for noble love. Joseph had a young heart and a young body when he married Mary, when he learned of the mystery of her divine motherhood, when he lived in her company, respecting the integrity God wished to give the world as one more sign that he had come to share the life of his creatures. Anyone who cannot understand a love like that knows very little of true love and is a complete stranger to the christian meaning of chastity. Joseph was, we have said, a craftsman from Galilee, just one man among many. What had life to offer to someone from a forgotten village like Nazareth? Nothing but work: work every day, with the same constant effort. And at the end of the day, a poor little house in which to rest and regain energy for the next day. But the name Joseph, in Hebrew, means "God will add." God adds unsuspected dimensions to the holy lives of those who do his will. He adds the one important dimension which gives meaning to everything, the divine dimension. To the humble and holy life of Joseph he added — if I may put it this way — the lives of the Virgin Mary and of Jesus, our Lord. God does not allow himself to be outdone in generosity. Joseph could make his own the words of Mary, his wife: "He has looked graciously upon the lowliness of his handmaid... because he who is mighty, he whose name is holy, has wrought for me his wonders." St Joseph was an ordinary sort of man on whom God relied to do great things. He did exactly what the Lord wanted him to do, in each and every event that went to make up his life. That is why Scripture praises Joseph as "a just man." And in Hebrew a just man means a good and faithful servant of God, someone who fulfils the divine will, or who is honourable and charitable toward his neighbour. So a just man is someone who loves God and proves his love by keeping God's commandments and directing his whole life toward the service of his brothers, his fellow men. Joseph entrusted himself unreservedly to the care of God, but he always reflected on events and so was able to reach that level of understanding of the works of God which is true wisdom. In this way he learned little by little that supernatural plans have a logic which at times upsets human plans. 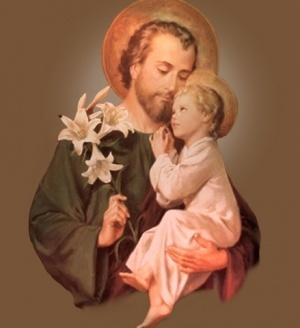 In the different circumstances of his life, St Joseph never refuses to think, never neglects his responsibilities. On the contrary, he puts his human experience at the service of faith. When he returns from Egypt, "learning that Archelaus had succeeded his father Herod as ruler of Judea, he was afraid to go there." In other words, he had learned to work within the divine plan. And to confirm that he was doing the right thing, Joseph received an instruction to return to Galilee. That's the way St Joseph's faith was: full, confident, complete. And it expressed itself in an effective dedication to the will of God and an intelligent obedience. With the faith went love. His faith nurtured his love of God, who was fulfilling the promises made to Abraham, Jacob and Moses, and his affection for Mary his wife and her Son. This faith, hope and love would further the great mission which God was beginning in the world through, among others, a carpenter in Galilee: the redemption of man. Faith, hope, love: these are the supports of Joseph's life and of all christian lives. Joseph's self-giving is an interweaving of faithful love, loving faith and confident hope. His feast is thus a good opportunity for us to renew our commitment to the christian calling God has given each of us. Joseph was one of the few craftsmen in Nazareth, if not the only one — a carpenter perhaps. But, as normally happens in villages, he must have felt called upon to turn his attention to other things: fixing a mill that was not working or, with the coming of winter, repairing the tiles of a roof. I am sure Joseph knew how to lend a hand in many difficulties, with work well done. His skilled work was in the service of others, to brighten the lives of other families in the town; and with a smile, a friendly word, a passing quip, he would restore confidence and happiness to those in danger of losing them. In human life, Joseph was Jesus' master in their daily contact, full of refined affection, glad to deny himself to take better care of Jesus. Isn't that reason enough for us to consider this just man, this holy patriarch, in whom the faith of the old covenant bears fruit, as a master of interior life? Interior life is nothing but continual and direct conversation with Christ, so as to become one with him. And Joseph can tell us many things about Jesus. Therefore, never neglect devotion to him — Ite ad Ioseph: "Go to Joseph" — as christian tradition puts it in the words of the Old Testament. A master of interior life, a worker deeply involved in his job, God's servant in continual contact with Jesus: that is Joseph. Ite ad Ioseph. With St Joseph, the Christian learns what it means to belong to God and fully to assume one's place among men, sanctifying the world. Get to know Joseph and you will find Jesus. Talk to Joseph and you will find Mary, who always sheds peace about her in that attractive workshop in Nazareth.